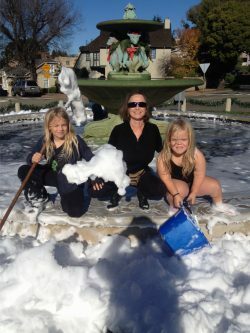 Friends and neighbors: Overnight on Dec. 16-17, some pranksters tossed two large (half-gallon) bottles of dishwashing liquid into the fountain. By morning, there was a 2-foot tall layer of dense soap suds covering the fountain pool. This much soap in the fountain may mean that the water in the system will have to be drained and replaced. We should know in a few days if that is the case. It also means that the fountain will not be running until that decision is made, while a defoaming agent is added to try to break down the soap. It’s unfortunate for us all, as the decorated fountain will not operate or be lit up for a few days during this holiday time. We will post an update when the fountain is back up and running. In the meantime, please help us discourage what may seem like an innocent prank, but is actually a thoughtless act that has real consequences.